We hope using the iPhone app is fairly intuitive. Here are the main features and how to access them. - Add a Document by clicking the + sign in the bottom right hand corner. You can choose to take a photo or upload one from your photo library from here. If your document is a long one or has multiple pages, you may take multiple photos to include in the one document. - If you have multiple accounts attached to your sign on, click on your name to the top right to view and access all your Squirrel Street accounts. Select the Pending/Processing Option and it will take you to this screen. There you can select the Pending/Processing Document in order to edit it. The view is shown below. 1) Let the document continue to process and we'll do all the work for you. 2) Cancel Processing and edit it yourself. 3) Delete the document by clicking the Delete link at the bottom. If you want to edit it yourself it will take you to the screen below. From here you can either Edit (By clicking the Edit button in the top right corner) or send it back to Processing. If you want to edit it will take you to the screen below where you can fill out all of the relevant data and then save it! In order to view the Receipts, click the Receipts section on the Home Screen. You will then see the view below where you can view all of your receipts. If you want to run a PDF report simply hit 'Export' and then select the receipts that you want included and hit 'Export Selected'. You can then email the report off! 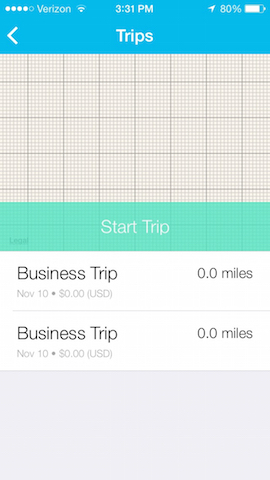 In order to Start a Trip, go to the Home Screen and select 'Trips'. It will then take you to the Trip Section as shown below. Next, hit 'Start Trip'. We recommend that any time you get out of the car or make a stop that you go ahead and drop a Pin. This will allow for the tracking to be as accurate as possible. 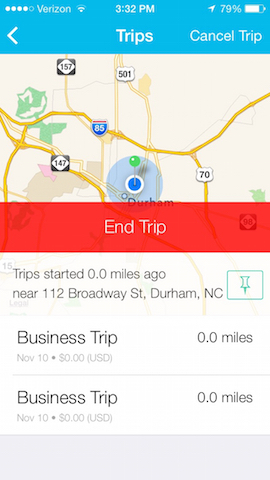 After you've finished your Trip you can hit 'End Trip' as shown below. It will then take you to the screen below so that you can either edit it yourself or send it to processing. In Settings, you can do things such as change your plan, change trip settings, and logout. When you open your app, you'll most commonly see the Home page. Click on "Accounts" to the top left to view any other accounts that you have access to. Then select the appropriate account. 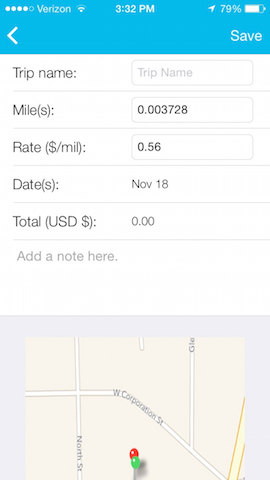 You'll then be able to view receipts for that account and submit documents for that account. Now get out there and get organized!